Bittersweet Enchantment: Calling all Fun-seekers! Inflatable-Zone has it all! Calling all Fun-seekers! Inflatable-Zone has it all! As Summer is soon coming to the end and fall right around the corner I remember how much fun I had on vacation when I went to an amusement park. What I loved best are the water rides! The thrill of sliding down a slide going super fast, tumbling and turning getting completely soaked. I miss how much fun I had that weekend. What if you could be that fun, that thrill to your very own home? You can! At Inflatable-Zone, you can bring the fun to you. 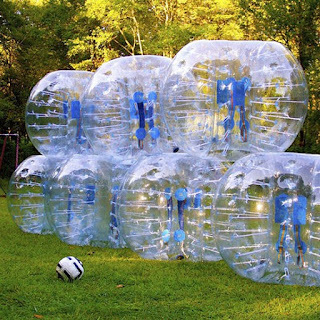 Established in 2008, Inflatable-Zone specializes in big inflatable products, including Bubble Soccer (GET HERE) or Bumper Ball or Loopy Balls call them whatever you may, water game toys like water roller, blob, and trampoline, inflatable slide and bouncer (read more). They are export-oriented and approved by our customers from United States, Europe, Canada, Australia and so on thanks to our fine workmanship and quality assurance. And customers are welcomed to offer us customization ideas, like logo-printing, personalized size, shape and design. Fun for the whole family, church get-together, birthday party, work picnic, out on the lake and so much more. There is so much variety to choose from. These top of line products will be the talk of the town! Personally, I love both the human hamster ball and the Inflatable Zone Bubble Tent. There is so much room in the tent you can put a full-size bed and everything! I would absolutely love being able to read while in the bubble tent, enjoying nature all around me since it's totally see-through. You can use it while camping or even in your own back yard. Products like the one seen above, the Inflatable Water Bundle comes with all you see here. Imagine how much fun could be had with one of these babies! 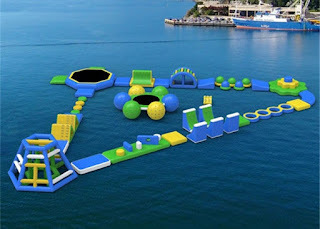 You can put one in lake, water park, pool or seaside. Inflatable-Zone promises to always offer affordable prices, and they occasionally offer promotion sale on some items. There is free shipping by express to United States, Canada, Europe, Australia, Asia, door to door service to your house. Their professional and dedicated team, advanced technology and machines guarantee the quality of our products. Carefully confirm and double check the condition of the items before shipping. There are so many amazing products to choose from. The possible are endless.